Enjoying Your Muskoka Cottage – Bug Bite Free! Anyone who has been in Muskoka knows that we host the occasional flying guest! The blackflies and mosquitos know how spectacular Muskoka is and come here to enjoy it too. Now don’t get me wrong, the bugs are never so bad as to make us not want to be in spectacular Muskoka and they are certainly not an issue when you are at your beautiful Muskoka Cottage with a gentle breeze coming off the lake to blow them all away. It is important, however, to try to avoid being bitten by these flying aggravations however many of us do not want to expose ourselves to chemicals like DEET which is one of the most widely used ingredients in store-bought conventional bug sprays for personal use. It is designed to repel, rather than kill insects. Here is what the Canadian government recommends. Choose a product that meets your needs. For example, if you plan to be outdoors for a short period of time, choose a product with a lower concentration of repellent and re-apply only if you need a longer protection time. Only use products that have a Pest Control Product registration number and are labelled as insect repellents for use on humans. Never use a product labelled as an insecticide on your body! Registered insect repellents containing DEET can be used safely when applied as directed. Health Canada completed its latest review of DEET products in 2002, which was supported by the Canadian Paediatric Society. The higher the DEET concentration in the repellent, the longer it provides protection. While this is true for protection against both mosquitoes and ticks, DEET repels mosquitoes for a longer time than for ticks. To get protection from ticks, look for a product that specifies use for ticks. Health Canada has approved the following concentrations for different age groups. Prolonged use should be avoided in children under the age of 12. Adults and children over 12: Up to 30% concentration of DEET may be used. One application of 30% DEET should be effective for six hours against mosquitoes. Children aged two to 12: Up to 10% concentration may be used, applied up to three times daily. One application of 10% DEET should be effective for three hours against mosquitoes. Children aged six months to two years: Up to 10% concentration may be used, applied no more than once daily. One application of 10% DEET offers three hours of protection against mosquitoes. Since DEET is a known eye irritant and can cause rashes, soreness, or blistering when applied to the skin and determining the right concentration could be complicated, you may wish to try some DEET free homemade bug repellents that I’ve found to help keep the bugs away this season. This first recipe comes from Wellness Mama and it literally takes just seconds to mix up and can be varied based on what you have available. There are several variations so you can try whichever one you have the ingredients for. Add 30-50 drops of essential oils (mix them as you like) to desired scent. The more oils you use, the stronger the spray will be. Dried herbs: peppermint, spearmint, citronella, lemongrass, catnip, lavender, etc. Use at least one herb from the mint family. Boil 1 cup of water and add 3-4 TBSP of dried herbs total in any combination from the above. I use 1 TBSP each of peppermint, spearmint, catnip and lavender, and also throw in a couple of dried cloves. Use as needed. Added bonus: it smells great and is very refreshing to the skin! Be warned this one apparently smells bad when it is wet, though the smell apparently disappears as it dries. It is based on a recipe that was supposedly used by thieves during the Black Plague to keep from getting sick. They used it internally and externally to avoid catching the disease and to keep the flies and other pests away. According to legend, it worked and they survived… but it definitely makes a great insect repellent these days! It is also very inexpensive to make and you probably already have the components on hand! Seal tightly and store on counter or place you will see it daily. Shake well each day for 2-3 weeks. To use on skin, dilute to half with water in a spray bottle and use as needed. Use whenever you need serious bug control! Other ideas were simpler including the use of vanilla extract in witch hazel and water or lavender oil directly on your skin. Basil leaves rubbed on the skin is apparently quiet effective too and any member of the mint family works. No matter which of these repellants you try or even if you decide to stick with commercially sold products, remember that repelling these critters is very important. 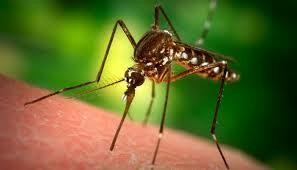 West Nile virus can make you very sick and has been found here in Muskoka.